Much has been said about the potential of chess to increase the power of our minds. After all, it’s a game where we will need to use our brains in order to deal with our opponent and capture their king. At the same time, we need to prepare our defences and prevent the opponent from capturing our king. And if the particular match starts to go bad for us, we need to think of ways in which we can turn the tides, or even fight to a draw. Well, all of the lessons of chess can be taught to little children as well. And your kid doesn’t have to show an incredible interest and proficiency at the game of chess from an early age. Namely, there are a few chess prodigies in the world that show an immense capacity for improvement in the game of chess at an early age. But you can still teach the game of chess to your children and enable them to have some fun with it. And there are few things that you need to do if you wish for your kids to take an interest in the game of chess. First of all, you will need to lead by example. Kids at an early age can be powerfully influenced by what their parents do. So, if you wish your kid to want to play chess, then you can start by playing chess yourself. It’s never too late to learn how to play chess – the game has a huge potential for complexity, but the basics are pretty simple to grasp. If your kid has a frequent experience of seeing you play chess with a friend of yours, then it’s likely that this will leave an impression on its mind. This will make it all the more probable that the kid will start to ask you about the game of chess, begging you to teach it how to play it. Of course, this doesn’t mean that this method is foolproof – it just means that it can make the difference. Another thing to try out is to have chess paraphernalia all around your home. You can place a chess board in a visible place in your house, so that every time your child enters the room, he or she will have to look at the chess board and pieces. Typically, the more luxurious the board and pieces look – the better the impression they will leave on the children. You can also have some chess books thrown here and there, and some chess posters hung on the walls. Finally, you can make an active effort to teach chess to your children. Namely, there are many simpler games that use the chess pieces on a chess board and the game mechanics, but on a level suitable for children. This will help them understand the basic concepts of the game, and they will learn how to play it very easily, and by having fun – which is most important. Google out some of these simpler chess variations and have some fun with your children. 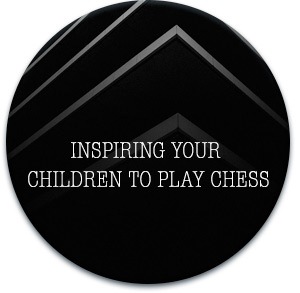 In the end, your kids may benefit from all of the wisdom inherently present in any and every game of chess. And this will give them a head start on the challenges that are invariably going to come later on in life. Nigerian refugee Tani, 8, becomes chess master in New York!